This lovely quality make up mirror has a scary magnifying lens which is illuminated via a halo light. 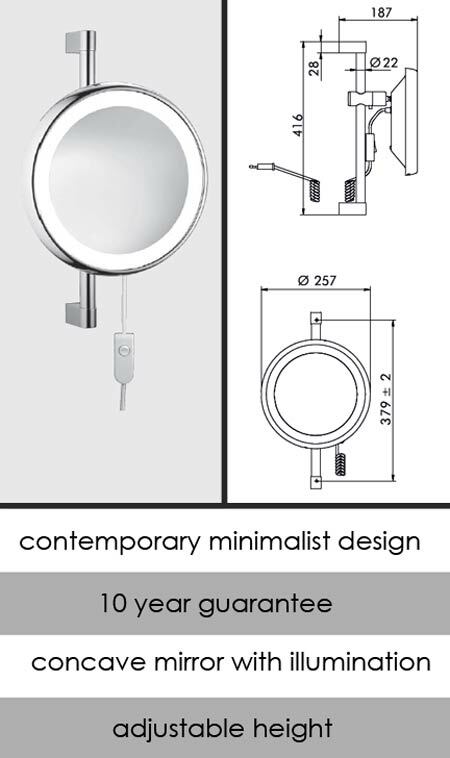 Wall mounted with a sliding adjusting rail, this cosmetic mirror is German manufactured and is part of a larger luxury bathroom accessory collection, which is considered the best quality in the UK. We have been selling this collection for nearly ten years and have never had a quality or corrosion warranty claim. * Contemporary high quality design. * Superior quality magnifying mirror.